I put together a collection of my favorite rose candles to prepare for The Bachelor season finale tonight. Rose is a great floral but many shy away thinking it will make their house smell like their grandmother. Things have come a long way since those days, and make no mistake, there is no Granny in this bunch. These candles are vibrant and youthful. Diptyque is know for their Baies candle any many try to duplicate this successful blend of currant and rose. It’s bright and slightly pungent. 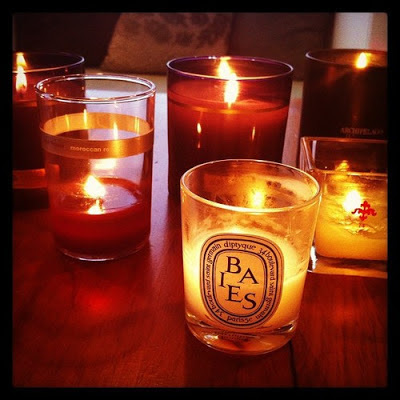 My favorite fragrance most similar to Diptyque Baies is the LAFCO Music Room (Fleurs de Baies) candle. It has the same fun and uplifting fragrance. I love the reusable hand-blown vessel for the LAFCO candle. Unfortunately, I don't have one at home tonight or it surely would have been in this picture! One of my favorite rose candles is by Red Flower. Moroccan Rose was my first introduction to a rose fragrance that didn't make me feel like an old lady. It's strong and slightly spicy, a welcome offering as many rose fragrance can become slightly sweet. Experts in floral fragrances, Belle Fleur dedicated an entire collection to the rose. Each candle highlights in a different rose absolute. Velvet Santal features Turkish Rose absolute while Petals D'Amore focuses on Bulgarian rose absolute. Belle Fleur candles come packaged ready for gift giving and I love the aubergine color of the vessels in this collection. The Le Cherche Midi 14 candle lists many notes in the description but the one that comes across the most to me when burning is rose bud. I love this clean, from the garden rose. In the back is also an Archipelago Stem candle. This fragrance is like bubble gum with a juicy center that explodes when you bite into it. This is the most youthful fragrance in the collection. There are so many rose fragrances available, these are just some highlights. What is your favorite rose candle? So much creative work. Wow! Beautiful blog and I really enjoyed your blog.